Are you right here, right now? Or are you somewhere else? My approach to a Zen-based mindfulness is rooted in seeing “where we’re at” in terms of a mental/emotional roadmap. It graphically lays out all the places we can be when we’re not totally here-and-now (which is also a place on the map). We give names to these mental realms and learn to go from one to another as needed. Are you flushed with anger, and the whole world seems to be turning red? You’re in the realm called Storyland. If you don’t think it’s helpful to stay there, you are free to step back from it into a cooled-down, objective realm called Orientation. Here you click into clear awareness of your surroundings, which include your mental state. Which you immediately notice is much less agitated than it was a few moments ago in Storyland. Now you know where you’re at, and you’re no longer being driven by your Storyland narratives. At this point you may decide to step back even from the clear here-and-now awareness of Orientation and enter the Zen side. When you’ve released all notions of place, distance and time – all possible boundaries separating you from anything, or anything from anything else – you’re in the realm I call Presence. This is the place of not-knowing, the source; this is the realm that underlies all the others, and is the only one you yourself didn’t create. Note that as soon as you’ve given it a name, you’re no longer there! None of these realms is better than any of the others, they’re just different “places” you can be. And, once you’ve become familiar with them and how to cross from one to another, you can choose to do so at any time. 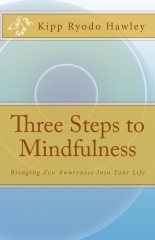 There are more realms than these three – you can read about them and learn how to use them in the online 3-steps manual of the Zen Mindfulness Cloudbook.